This month’s edition of The Weekend Gourmet Dines Out is featuring my fabulous birthday celebration in Dallas. The fun started with a show stopping cocktail and dinner at renown Dallas Chef Stephan Pyles’s Stampede 66. 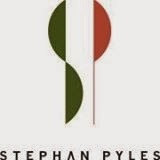 It concluded with an over-the-top dessert tasting at his namesake Stephan Pyles, located just up the street from Stampede 66. 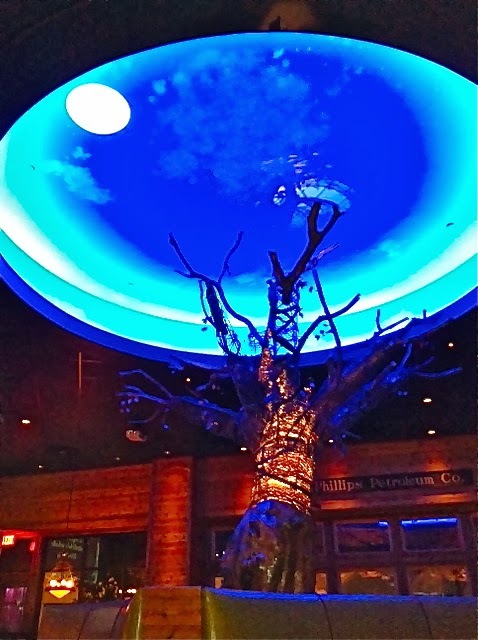 It was a birthday celebration I won’t soon forget…the food was fabulous and the service was attentive and friendly! 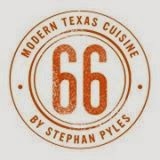 Our first stop of the evening was Stampede 66, Chef Pyles’s ode to Texas cuisine. Think upscale Texas comfort food. We arrived and were warmly welcomed. The first thing we noticed was the decor, which was rustic Texas with colorful modern accents! 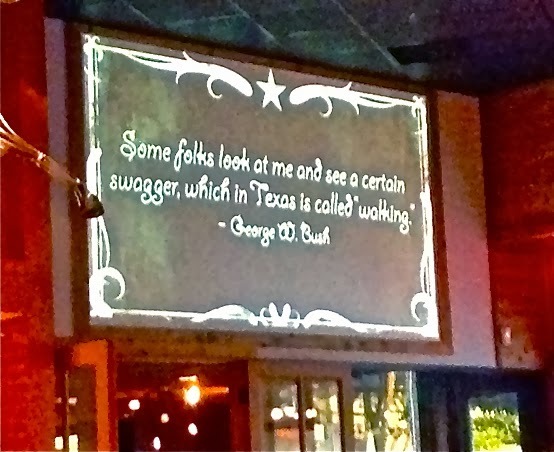 The screen below featured a rotating collection of humorous sayings by famous Texans. 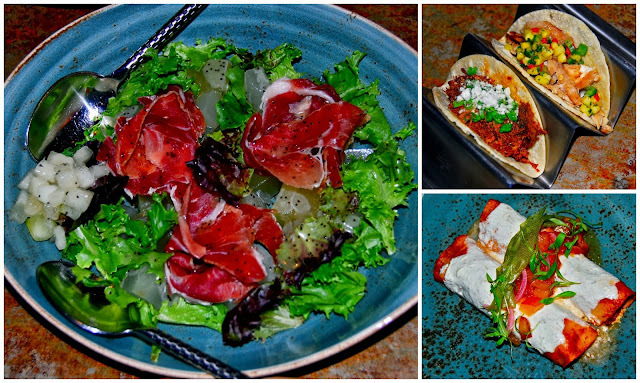 We decided to kick things off with a trio of starters: a salad, tacos and enchiladas. We shared the artfully presented Ham & Melon Salad with Ms. Corbitt's Poppyseed Dressing, Gulf Coast “By-Catch” & Brisket soft tacos, and Duck and Sour Cream Enchiladas. All three were bursting with the big flavors that we love! The salad was absolutely gorgeous and the combination of sweet melon, salty ham and tangy-sweet dressing was a winning combination. The tacos were delicious, especially the grilled fish taco. The duck enchiladas were perfectly spiced and full of rich duck meat. Even Michael, who isn’t a huge duck fan, was fighting me for the last bite! Our server suggested we give the Modern Star Canyon margarita a try to go along with our starters. He told us that the presentation was amazing...and that the end result was gorgeous and delicious. He didn’t steer us wrong! A few moments later, out came a tableside margarita cart…and then the show began, complete with liquid nitrogen. Michael recorded the making of our margarita, which you have to see to believe! 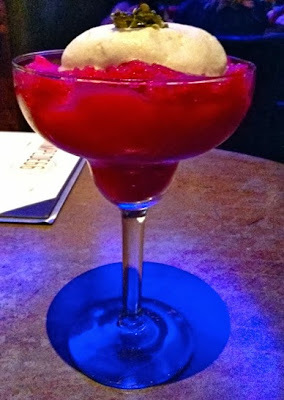 We were mesmerized with the preparation of the margarita, which was vibrant fuchsia and flavored with prickly pear juice. The margarita was amazing…and large enough to share. It was topped with a fluffy lime crème and a sweetly spicy candied jalapeno. It started out the consistency of sorbet, but melted into a slushy cocktail after 10 minutes or so. It was served with a silver straw that also featured a small spoon on the end. That way, we could enjoy our drink frozen at first…then switch over to the straw as it melted. Genius! For our entrees, I just had to have what many people consider the best fried chicken in Dallas. My steak-loving husband quickly locked in on the wood-grilled ribeye. Both were excellent! I had the Honey-Fried Chicken, served with Mable’s Buttermilk Biscuits and Mashed Potato Tots. The chicken was crunchy on the outside and juicy on the inside. It’s injected with honey before being served, which gives it a slightly sweet taste. The biscuits were just like grandma used to make, and the mashed potato tots were an upscale version of one of my favorite childhood foods. This is what I call gourmet comfort food: familiar, but with a twist! Michael’s Wood Grilled Ribeye was served with Green Chili Mac N’ Cheese. The steak was cooked just like he ordered and was tender and juicy. He couldn’t stop raving about the mac ‘n cheese, proclaiming it “the best he’d ever tasted.” There you go. I had a bite, and it was cheesy…with just enough kick to give it some character. Together with the steak, it was a great flavor combination. We were headed to Stephan Pyles for dessert, but we couldn’t resist sampling one dessert at Stampede 66. We decided to share the Butterscotch Pudding with Salt Caramel. It was rich and creamy…and artfully presented. This is pretty much the perfect dessert for any Texas Longhorns fan in your life! All of the desserts were delicious, gorgeous and artfully presented. After this amazing birthday dessert tasting, we headed back to our hotel stuffed and happy. We were treated like royalty at both Stampede 66 and Stephan Pyles thanks to Chef Pyles’s amazing and friendly staff. They made sure that I had a birthday to remember! Disclosure: Stampede 66 and Stephan Pyles provided us with complimentary dinner and dessert to facilitate this article. No further compensation was received, and all opinions expressed are my own. All photographs are copyrighted by Michael K. Garcia and may not be copied or otherwise used without permission.